Homalanthus populifolius (syn Omalanthus populifolius. )is commonly known as the Bleeding Heart Tree, and the foliage is similar to the of the Poplar. This is a native plant, found in the rain forests of New south Wales and is also found in Queensland and Victoria. 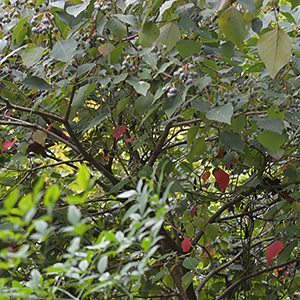 Although it does have attractive heart shaped foliage which provide brilliant autumn colour it is not a tree widely used in cultivation. It prefers a humus rich moist soil and will grow well in part shade to full sun. This is a fast growing tree that will quickly reach around 5 metres in height. It does have the potential get nearly twice this size in good conditions. Its natural habitat is on the margins of rainforest areas where it acts a a pioneer plant. In cultivation it will develop a single trunk and a broad spreading crown. The problem is that the Bleeding Heart tree self seeds very easily and has the potential to become a weed. The seed is spread by birds. Seedlings take as little as 2 years to develop into a fruiting tree, so spread can be rapid if left unchecked. This is not a tree that is widely offered for sale, however some native plant nurseries do offer it.